LeBron James has signed with the Los Angeles Lakers in one of the biggest free agency moves in basketball memory and, while we don’t have any PFF analysis on the move, it does time nicely with an article we had planned with a slight basketball twist. In basketball, a triple-double is a double-digit total in three of five statistical categories, but generally will be achieved with points, rebounds and assists. It got me thinking. What would be the NFL’s equivalent of a triple-double? So, after looking through all the Premium Stats available with PFF Elite subscriptions, I settled on the pass-rushing triple-double: players who accumulated double-digit sacks, hits and hurries over the course of the regular season. 16 players in the NFL managed the feat in 2017, so here’s our look into the performance of each one. 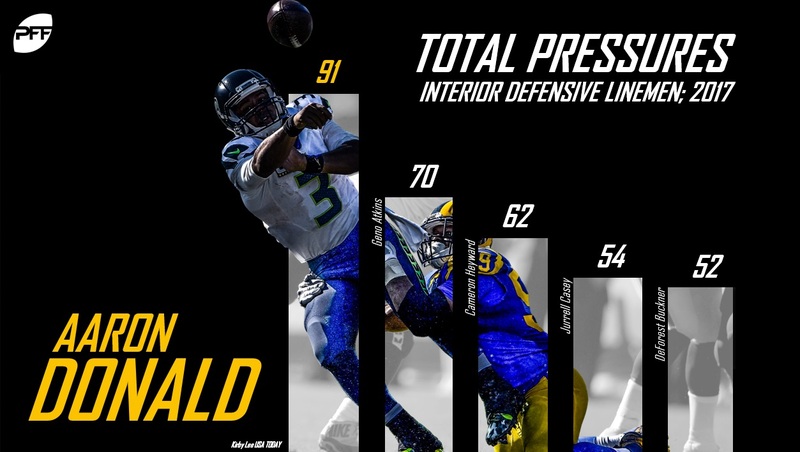 Showing how rare it is to find an interior pass-rusher who can routinely dominate enough to generate double-digit sacks and hits, Donald and Atkins were the only two interior defensive lineman to complete a triple-double in 2017. Donald has accomplished this in two of his four seasons in the NFL so far, and his 14.8 pass-rushing productivity rating was 3.0 points higher than the next highest player at the position, Atkins, coming in at 11.8. Atkins has now racked up double-digits in all three categories in each of the past three seasons and in four of his eight seasons in the NFL. In a world where we routinely hear about players being too undersized at the position, the NFL’s two most dominant pass-rushers on the defensive interior have made teams pay for passing on them for being too small. Triple-doubles are much more frequent among edge defenders, but there are still several things that stand out from this list. Both the Jaguars and Chargers had two edge defenders on the list, with Campbell and Ngakoue combining for 143 total pressures in the regular season and Bosa and Ingram combining for 151. Those are two pretty astounding duos to be able to count on off the edge. While the Bengals only had one edge defender on the list, they have two when you pair Lawson off the edge with Atkins on the interior. All the more impressive is the fact that Lawson did it as a fourth-round rookie, and was the only first-year player to make the list. Despite being passed over, apparently due to injury concerns, the former Auburn standout was the only rookie who made enough of an impact to register double-digits in all three categories. Griffen has been quietly consistent when it comes to pass-rushing triple-doubles, achieving them in three of the past four seasons. Miller has been the standout here though, with double-digit sacks, hits and hurries in every season with the exception of the 2013 season where he played just 552 snaps due to injury. 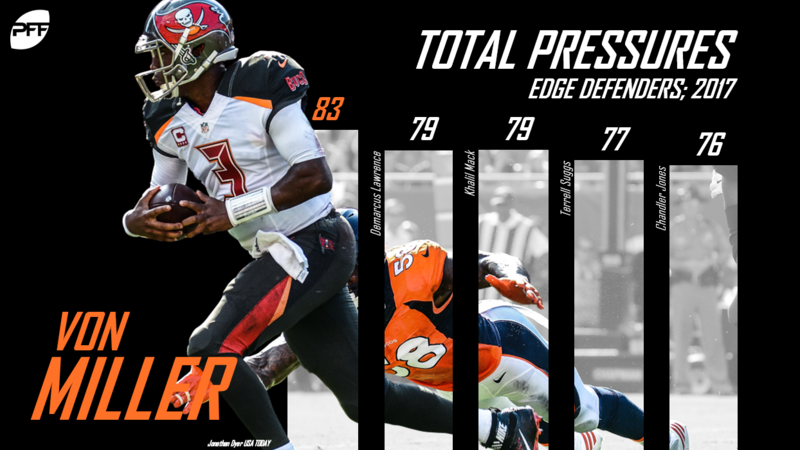 In a league where getting pressure on the quarterback continues to be ever important, these are the players who make an impact as pass-rushers, and leave their mark on opposing quarterbacks in the process.